Quantum bits, or qubits, are the building blocks of quantum computers, which will offer enormous advantages for searching expansive databases, cracking modern encryption, and modelling atomic-scale systems such as biological molecules and drugs. The world-first result, to be published in Nature on April 18, brings these machines one-step closer, describing how information was stored and retrieved using the magnetic spin of a nucleus. “We have adapted magnetic resonance technology, commonly known for its application in chemical analysis and MRI scans, to control and read-out the nuclear spin of a single atom in real time,” says Associate Professor Andrea Morello from the School of Electrical Engineering and Telecommunications at UNSW. The nucleus of a phosphorus atom is an extremely weak magnet, which can point along two natural directions, either “up” or “down”. In the strange quantum world, the magnet can exist in both states simultaneously – a feature known as quantum superposition. The natural positions are equivalent to the “zero” and “one” of a binary code, as used in existing classical computers. In this experiment, the researchers controlled the direction of the nucleus, in effect “writing” a value onto its spin, and then “reading” the value out – turning the nucleus into a functioning qubit. “We achieved a read-out fidelity of 99.8 per cent, which sets a new benchmark for qubit accuracy in solid-state devices,” says UNSW Scientia Professor Andrew Dzurak, who is also Director of the Australian National Fabrication Facility at UNSW, where the devices were made. 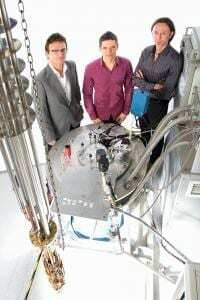 The accuracy of the UNSW team’s nuclear spin qubit rivals what many consider to be today’s best quantum bit – a single atom in an electromagnetic trap inside a vacuum chamber. The development of this “Ion Trap” technology was awarded the 2012 Nobel Prize in physics. Morello’s PhD student Jarryd Pla is the lead experimental author of the work, which was conducted in collaboration with the groups led by Dzurak and Professor David Jamieson at the University of Melbourne. Morello, Dzurak and Jamieson are all Program Managers in the ARC Centre of Excellence for Quantum Computation and Communication Technology. In September 2012, the same UNSW team reported in Nature the first functional quantum bit based on an electron bound to a phosphorus atom embedded in silicon, “writing” information onto its spin and then “reading” the spin state back out. With their latest result, the team has dug even deeper into the atomic structure to manipulate and measure the spin of its nucleus. This is the core of an atom, containing most of its mass, but its diameter is only about one-millionth that of the atom’s diameter. Electron spin qubits will likely act as the main “processor” bits for quantum computers of the future, coupled with other electrons to perform calculations. But nuclear spin qubits could also be integrated and could provide a useful memory function or help implement two-bit logic gates between the electronic qubits, the researchers say.